and management's bad faith in the the Collective Bargaining Agreement (CBA) negotiations. The employees are all members of the Pinag-Isang Lakas ng Manggagawa sa Metro, Inc. (PIGLAS); the LRT operators accredited union. It is a member of the National Federation of Workers Union (NFWU), one of the Kilusang Mayo Unos (KMU) 13 federations. The Light Railway Transit Authority (LRTA), the government agency in charge of railway line, and the Department of Transportation and Communications (DOTC) had "contracted out" the operations to Metro Transit Organization, Inc (METRO Inc.). Ironically, Metro is also owned by the LRTA. The two government agencies have announced that they will not renew Metros contract after it expired last August 1, and that they plan to give it to one of seven private firms (one of them a Canadian company contracted to build the line extension to Cavite) that have expressed interest in joining the bidding. Both LRTA and DOTC have alternated in denying and defending the planned privatization of the railway, which could raise passenger fares up to PhP50. In a series of public hearings conducted in the third quarter of 1999 preparatory to a fare increase, and participated in by KMU and PIGLAS, these government agencies made explicit presentations of the plan, using slides, transparencies and even a video documentary that sought to justify the fare hike and LRTs privatization. But lately, they have been denying the latter, despite the fact that they are publicly pushing for private firms to take over operations from government-owned Metro Inc. 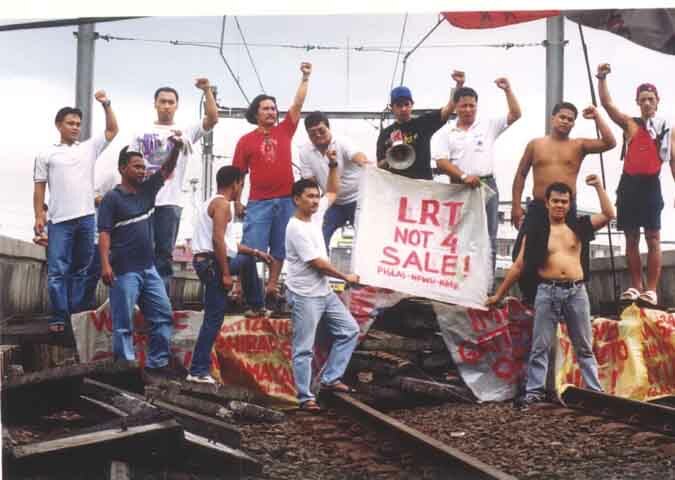 Although it was not intended to coincide with President Estradas visit as part of "destabilization moves" by militant labor, as some quarters insinuated, the LRT strike not only alarmed but also embarrassed the regime with its initial successes. The governments subsequent pronouncements and actions thereafter amounted to a virtual crackdown against PIGLAS, especially its leadership. After the strike pickets at the Bambang and EDSA stations were broken up violently by police, SWAT, and security guards from July 26-27, the President ordered the arrest and filing of charges against the strikers. In response to Estradas directive, LRTA yesterday filed a bundle of criminal and civil charges against four members of PIGLAS: robbery, malicious mischief, vandalism, grave coercion, physical injuries, illegal assembly, alarm and scandal, grave threats, disobedience to lawful order and unjust vexation. For its part, Metro Inc. filed complaints against the union, accusing it of causing injuries to security guards that participated in the police assault at the picketlines. On top of this crackdown, all of the 1,000-odd employees of Metro Inc. have been sacked in effect, with the non-renewal of the government firms contract. LRTA, DOTC and Metro Inc. blame the strike and PIGLAS for this shocking overreaction on part of the government. Despite these heavy odds, the LRT workers vowed to continue their struggle, with the support of other progressive and militant organizations. They are banking on their unity to cripple the operations of the railway system, which has been partly repaired but whose full capacity remains hampered by the lack of personnel and major repairs. The governments boast that it will be able to make the train system run "on a limited basis" without the striking workers fell flat on its face, when the handful of coaches filled to overflowing with passengers broke down in the middle of the tracks on their first run today (August 2), stranding thousands of irate commuters on a morning peak-hour. There is no telling what will happen on the subsequent runs, since the trains are computer-guided machines being forced to function manually by the foolhardy officials of LRTA, Metro Inc. and the DOTC. The message to be gleaned from this boo-boo is clear: it takes more than macho propaganda to make the whole LRT system function. It is also becoming more and more evident that an agreeable solution to this crisis lies only with the governments accommodation of the LRT workers just demands. However, a conciliation meeting scheduled at the Department of Labor and Employment (DOLE) head office was boycotted by LRTA, although PIGLAS officers and their lawyers were present. By thus taking a hardline stance against the strike, it is not only the lives of hundreds of workers that are jeopardized, but also those of the more than 400,000 commuters who patronize the railway line daily. manning the picketline at the LRT Bambang Station. Most of them wore no nametags or IDs on their uniforms; some were even in civilian clothes. They were also backed up by a fire truck and 30 security guards from Lockheed Agency. The assault was led by Col. Dimayuga of the Western Police District (WPD). Based on the story of Allan, a member of the unions Board of Directors, these dispersal teams came from the directions of Tayuman and Doroteo Jose stations. Realizing their intentions, the strikers and supporters formed themselves into a human barricade on both ends of the Bambang station. When the team from the Tayuman station arrived at the picketline, the leaders of the strikers pleaded with Col. Dimayuga to refrain from assaulting and demolishing the picketline, since their labor dispute with the management is still on-going. However, their plea fell on deaf ears. After a few minutes, Col. Dimayuga ordered the assault force to forcibly disperse the strikers and their supporters. The latter held their ground by sitting on the railway tracks while still on linked-arm formation. When the dispersal team broke through the human barricade, the strikers and supporters stayed on and held their ground. The former, however, ransacked their belongings and demolished their picketline. After a while, they reverted to assaulting the strikers and supporters. But this time, they used a water canon from the firetruck to disperse the strikers while assaulting them. In the ensuing commotion, many strikers and supporters were hurt by the teams violent dispersal. The rallyists retreated and reassembled on the street below. The same fate met strikers and supporters holding their ground at the other end of the station. Some of them were even snatched away by plainclothesmen, but were able to escape later after a commotion. They also retreated and regrouped with the other striking workers and supporters waiting for them below the station. Many strikers and supporters suffered bruises and contusions due to the violent dispersal of the perpetrators. After holding a program below the station, the strikers and supporters marched to the Philippine Independent Church (PIC) on Taft Avenue to rest. Four hundred strikers (400) with five supporters manning the EDSA station were violently dispersed by 200 PNP/SWAT members, lead by Col. Cabigon of the Southern Police District (SPD). The dispersal started at 6pm and ended at past midnight, About 60 security guards from Alert Agency and 2 firetrucks accompanied the perpetrators in assaulting the victims. According to Sammy Malunes, Union President of the Pinagkaisang Lakas ng Manggagawa sa Metro-LRT (PIGLAS), the strikers and supporters were alerted when the perpetrators, armed with shields, truncheons and guns arrived at the picketline. They then organized themselves into three groups. The two groups assembled on both ends of the EDSA Station while the other one remained below on the street. The dispersal team also divided itself into three. The two contingents climbed up the stations of Libertad and Baclaran and walked along the railway towards the direction of the EDSA Station. The other one faced the group of strikers and supporters manning the entrance of the EDSA Station. At exactly 8 PM, the assault forces simultaneously started to disperse the strikers and their supporters, even though their leaders had appealed Col. Cabigon to desist. However, the dispersal failed due to the determined resistance of the picketers. A more violent dispersal ensued at 12 am, when the dispersal teams went on all-out assault. Though the picketers were merely seated on the railway tracks when the dispersal teams began beating them up with truncheons. Scores of workers and supporters were hurt in the attack. The victims suffered bruises and contusions. 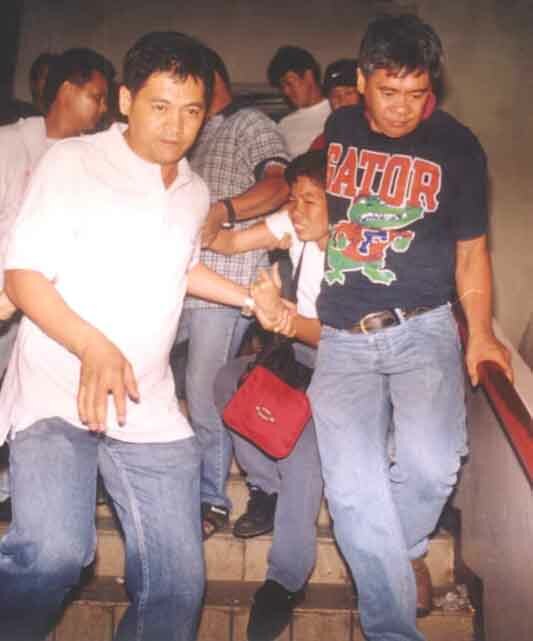 One of them, Rojo Cruz of the National Federation of Workers Unions (NFWU), was arrested by plainclothes policemen and taken to the Pasay Police Station. This despite the fact he was badly injured. He was later released after being blottered at the police station. Eventually, the dispersal teams succeeded in dispersing the picketers. The victims retreated and reassembled below the station. They later marched to the Redemptorist Church in Baclaran to take a breather. located at MIA Road, Pasay City, was assaulted by 100 PNP/SWAT members of the Southern Police District (SPD) and 10 security guards from Alert Security Agency. They were armed with truncheons, shields and guns and accompanied by a firetruck. The group was headed by Col. Cabigon. The ensuing incident was narrated by Allan Cortenz, one of the Board of Directors of PIGLAS. According to him, the striking workers at first negotiated with Col. Cabigon to refrain from demolishing the picketline. But the police merely ignored their pleas and commenced dispersal operations. The picketers resisted, but were driven away due to the viciousness of the attack. They retreated to Gate 2, located at Tramo, Pasay City, where other strikers were also picketing. The perpetrators however, still chased them. In the commotion, some of the strikers suffered bruises and contusions. At 5:00 in the afternoon, some 150 striking workers manning Gate 2 of the LRT, located at Tramo, Pasay City, went on alert when they saw 80 of their fellow-strikers from Gate 1 running towards the picketline, pursued by 100 PNP/SWAT members and 10 security guards from Alert Security Agency. The group was again headed by Col. Cabigon of the Southern Police District 9SPD). A firetruck also backed them up.